Mike Zimmer said at this point he feels comfortable with his personnel. But he felt that way about his offensive line at this time last year, too. For a second consecutive offseason, the Vikings made the offensive line a focal point of renovations. And once again, head coach Mike Zimmer said at this point he feels comfortable with his personnel. By now, you know the story. Except this iceberg that helped sink the Vikings’ 2016 season was made of Matt Kalil’s torn hip labrum, Jake Long’s torn Achilles, John Sullivan’s bad back, Mike Harris’ career-threatening ailment, Phil Loadholt’s retirement and Andre Smith’s injured triceps. A year later, the Vikings expect to finally debut the full starting offensive line during Sunday’s “dress rehearsal” of a preseason game against the 49ers at U.S. Bank Stadium. Left tackle Riley Reiff, the $56 million offseason addition, is expected to debut Sunday after a back injury has limited him throughout August. The Vikings’ interior offensive line depth has looked improved with the emergence of center/guard Nick Easton and the selection of rookie Pat Elflein in the third round. Tackle is a different story. The Vikings ponied up to sign two starters, Reiff and Mike Remmers, in free agency, but kept the status quo behind them. When asked about tackle depth in training camp, Zimmer said a lot with a few words when noting they “need to stay healthy” at those spots. If not, the tackle they’ll currently turn to is Rashod Hill, the second-year undrafted man out of Southern Miss. 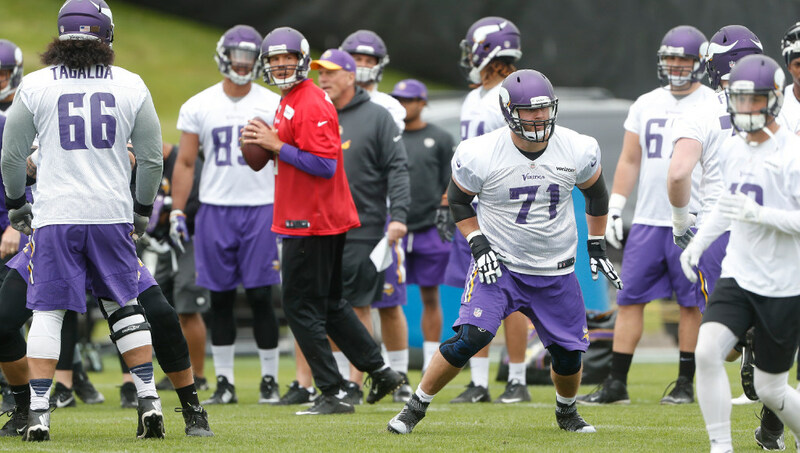 With Reiff back in the fold, Hill has been taking snaps at right tackle during practices to seemingly prepare as the Vikings’ swing tackle this season. Vikings quarterback situation taking shape, but who will be No. 3?